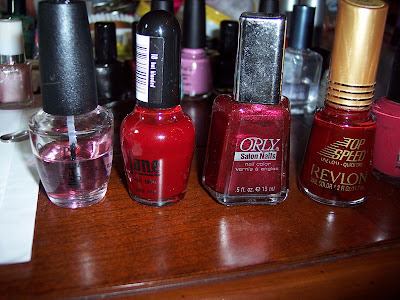 I found some more old polishes I had while cleaning out my desk, I think this is the last of them how sad. I picked Orly Moonlit Madness to wear, it's nothing to write home about the color isn't my favorite. It thinned over the years which is kind of odd, so application was a piece of cake! One coat. 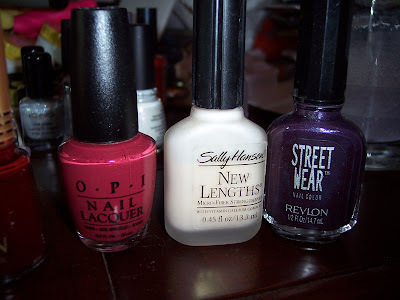 Here are the polishes I found: Left to right, Maui Mango, SH Sheer French Buff, Revlon Street Wear Grape. 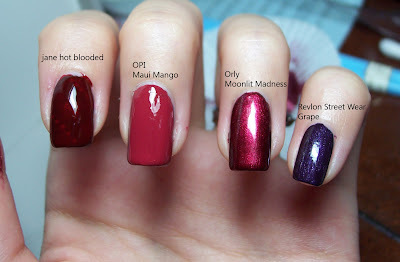 Left to right, OPI base coat I found last week that's 14 years old and hasn't changed a bit, jane Hot Blooded, Orly Moonlit Madness, and Revlon top speed in Cherry. The Revlon smelled really, really bad! 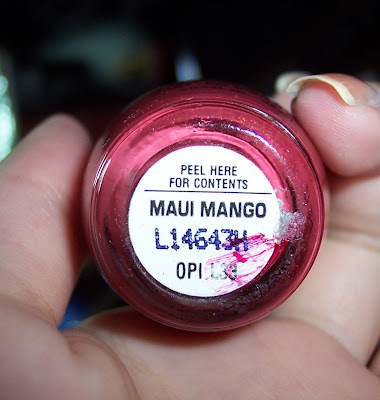 The oldest polish I own, OPI Maui Mango. I put the bottle on top of some polish I put on paper and messed up the label as soon as I found it, figures. I think this one is from their first collection in 1989, anyone know? I swatched some of them over my old mani I was curious how Maui Mango looked, surprisingly it wasn't that goopey and applied well without needing any thinner. 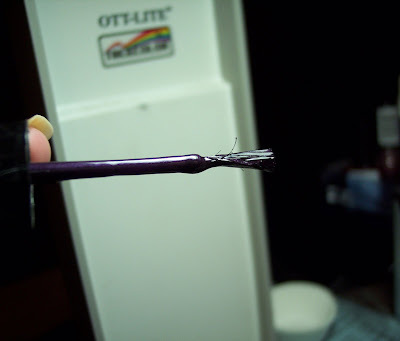 This is the brush for my purple Revlon, this is what stopped me from wearing it in the past. I trimmed the brush so I can't wait to wear this! Wow! Wasn't that great finding those old polishes? I love the color of the Orlay, such a pretty deeper shade of red. Street Wear! I really loved that whole line. Boy, does that bring back some memories. Neat finds! I like the Orly red on you! Hi Mary, yes I can't ever remember being this excited at finding a ridiculously dusty and dirty box! I love that polish color. It's really pretty on you. I don't own any old polishes. I got rid of them. I'm really sorry I did.